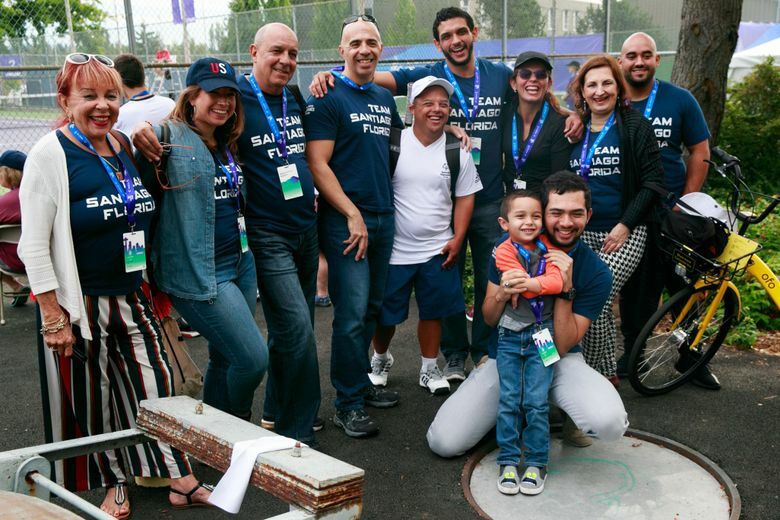 It takes a village to raise a child, and Team Florida tennis player Santiago Castro has brought his village with him all the way to the Special Olympics USA Games in Seattle. 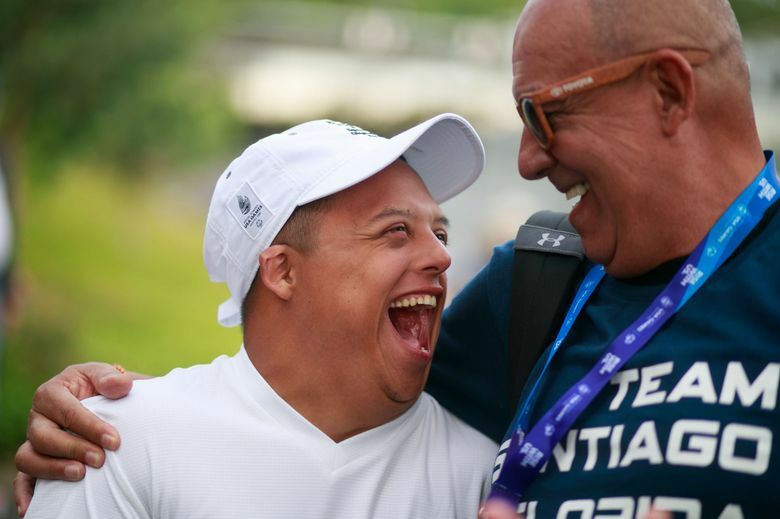 In Santiago “Santi” Castro’s week at the 2018 USA Games, he not only has had his fellow teammates and coaches to cheer him on as he represents Team Florida in tennis. He has also had a contingent of fans sporting “Team Santiago” t-shirts, waving red and blue pom poms, and shouting words of encouragement to him in both English and Spanish. This group — 10 of them in all, though an eleventh is on the way — is Santi’s family — his mother and step-father, his sister and brother-in-law, his brother and nephew, his step-brother and step-grandmother, and his grandmother and grandfather. Most had come to Seattle from Miami, but his grandparents had traveled over 4,000 miles from Colombia so they could watch Santi compete in the USA Games. As soon as Santi learned that he would be playing in the USA Games, the family started planning their trip. Getting everyone from Miami, and Colombia, to Seattle was a must. “He’s the champion of the family,” said Santi’s grandmother, Ana Rivera. (Santi’s brother, Jose Castro, translated for her). While he may be the champion of the family, they’re the village that raised him, and as much as Santi means to each of them, each has been crucial in his journey that got him to where he is today. In Santi’s early years, when he and his immediate family still lived in Colombia, his grandmother helped raise him, putting him through exercises and other activities that kept him stimulated. Now that Santi and his family live in the United States, Ana gets to see her family around once a year, though she says it’s still incredibly hard to be apart. She was close to tears when Jose won his singles match Wednesday afternoon. “Estoy muy emocionada,” she said. Santi’s older brother, Jose, is his role model. Growing up, Santi always wanted to play the sports that Jose played and now is thinking about working at Carnival, where his brother works. Santi was excited to have Jose’s five-year-old son in Seattle to watch him play, too. Ever since Santi’s step-father, Avian Capo, started dating his mother, Avian, who played tennis when he was younger, has worked with Santi to help him become a better tennis player, with a focus on improving his conditioning. He’ll take Santi to a court near their house to play and helps ensure he sticks to a healthy diet. Santi’s family agrees that his mother, Liliana Bohorquez, has been the driving force behind Santi’s journey. She was the one who pushed him to play sports — basketball, soccer, and eventually tennis — alongside kids without disabilities. She always knew what he was capable of and would sign him up for sports without telling the coaches or anyone else that he had a disability. Once people would find out, it wouldn’t even matter, because Santi was able to prove that he belonged there with everyone else. She says that the coach of the tennis team at Santi’s high school thought it was joke when he signed up to join the team. He went on to play for varsity for four years, was one of the four students who’d regularly play, and won an award for best varsity player. Now tennis is an integral part of his life. 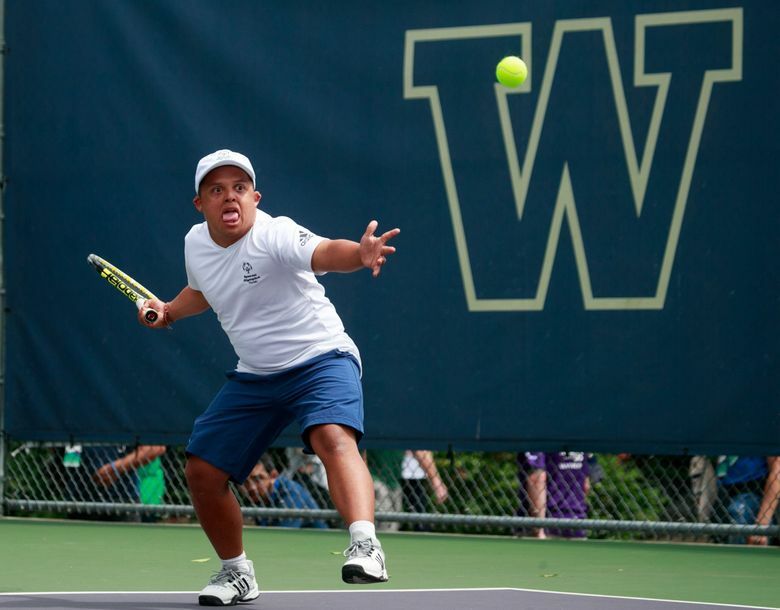 He has practice at least three times a week —in addition to Special Olympics events, he plays in adult-level USTA matches. He also does private workouts and conditioning with his step-father. Beyond his athletic achievements, he recently graduated FIU through an inclusion program. “I don’t put any limits on him,” Liliana said. And at 22, she says, she says he still has room to grow — in tennis and conditioning, but also in improving his speech through speech therapy. 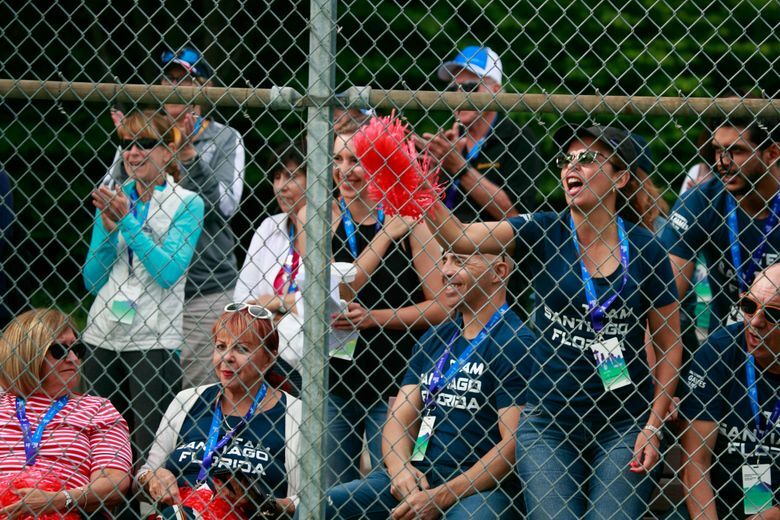 Santi’s singles match was moved to a semi-enclosed court with USA Games banners plastered all over the fence, making it difficult for his family to watch the match. Half of the group ended up watching from behind the adjacent court, while the other half went around to the other side, where they sat in chairs and watched through the bottom of the fence, which was uncovered. Santi’s family was relieved when he pulled out a come-from-behind, tiebreak victory in his single match. Despite having to split up to watch the match, they came together to give him the biggest hugs when he came off the court.